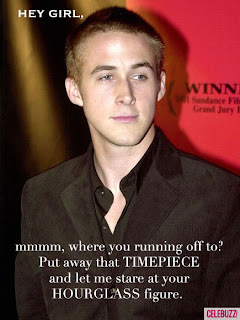 Myra McEntire: Ryan Gosling Says, "Hey Girl!" Ryan Gosling Says, "Hey Girl!" I believe this is confirmation from a higher power that if Fox makes the HOURGLASS movie, they will cast Ryan as .... who cares, really? Just as long as he's in, and I get a set visit. And don't end up with a restraining order. Click here to see more Ryan Gosling Reads Young Adult ... and sometimes he cries. If you don't know about "Hey Girl" here's a little explanation. Oh this is a treasure. Isn't this great?!?! I texted it to our entire bookclub! AND, I can't even think about Ryan playing any part in Hourglass, I'm already needing a bib to catch all the drool just with my thoughts!